It's Lovely! I'll Take It! : Good boys! Good possessed boys! When I think "Would I like to live in this house?" My first consideration is "Does it come with a man in shorts carrying a dog with glowing eyes?" Hmmm. Maybe. But can you toss in a second dog with glowing eyes? Perhaps one that will block the way to the bathroom? You can? Excellent! Sign me up. 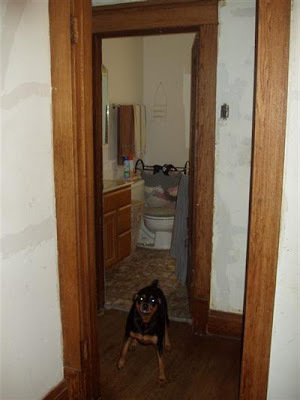 Found by Mary the Nebraska Realtor. What I really like about this property is that they've made it so darn easy to get asbestos-related cancer. Just close your eyes and imagine yourself on a rocker (or a swing!) on that front porch. As soon as those winds sweep down over the plains and the rain falls on your asbestos roof that's about to peel off, voila! It will fall in perfect sized pellets to enter your lungs and begin wreaking havoc. Do you think that's why the man and the dogs look so crazed? You missed the other possessed dog guarding the dog room, the cat room, the shelf full of fish tanks, the couch woman sitting next to the cat couch, the scary doggy play room, and the stove in the back yard hiding from all the animals. This is The Animal House! 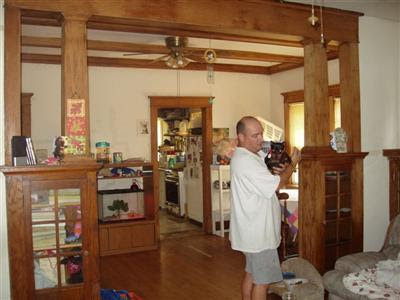 Listing says, "Home needs some work." Ha! Should say, "Home needs some Febreeze." This is one of your best yet. Isn't that the security system? Version 1.0 is guarding the bathroom, while version 2.0 is undergoing beta expansion.